My nineteen month old, Tyson, isn't much of a talker. Most of the time, his brother is telling long, detailed stories which doesn't leave much room for Tyson to pipe up. I have talked with my pediatrician who is slightly concerned about his language development. For the meantime, he isn't referring us to any therapists.He told me they would just tell us to read with him and well, we're doing that. He did note it in Tyson's file, though. As a teacher at heart, I know that early intervention is KEY. 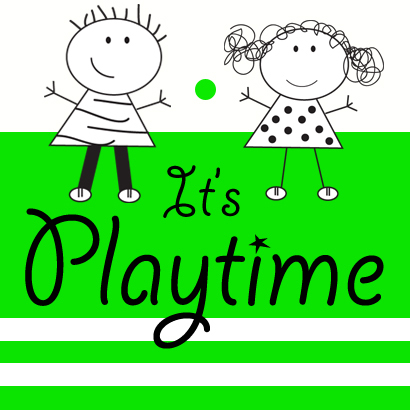 Lately I've amped up our playtime to include play that will foster language development. I read this Montessori language idea at dailymontessori.com. 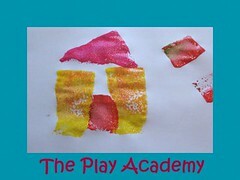 While I am not trained at all in the Montessori approach, I decided to try the activity in our own way. Since we've been reading a lot of books about water and beaches, as well as playing in the sand, I chose beach words. 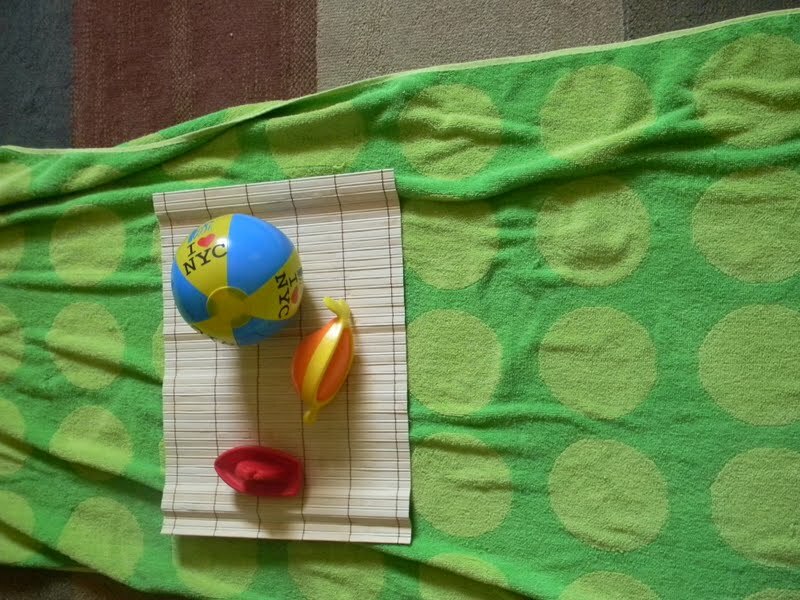 I put out a beach towel and three objects, naming each object as I set it on the towel, "Ball. Boat. Fish." I let him hold the objects, throw the objects, explore the objects. Later, we unrolled the beach towel again. This time, I set out the objects, named them, and then asked Tyson to point to the objects. He did a great job with this. As a teacher, I know that a huge part of learning occurs through transfer. In other words, if a child knows something in one setting and then realizes he can use that same knowledge in another setting, massive learning will occur. I wanted Tyson to do that with language. I took the same three objects and put them on the table. We named each one. Then Logan and I created them out of playdough. 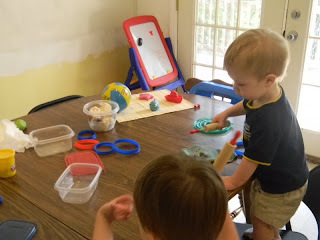 Tyson got to help as well by pushing the fish cookie cutter into the dough and rolling the ball of dough. As we made a ball, a boat, and a fish, we talked about the words. We said the words in isolation. We talked about them in descriptive ways. Finally, I tried to help him transfer the knowledge to books. We read some of these books about the beach and we looked for all of the same objects, as well as naming other objects that were present. We celebrated when Tyson pointed to the object. We celebrated his partial attempts at saying the words. This activity is something that you can do constantly throughout the day. In fact, most parents are probably naming and showing objects on autopilot. I think the difference in the activities I chose for Tyson was that I focused on three objects in a variety of places. While this might not be necessary for all children, for a child that language is developing slower, it could be helpful to slow it down and help them recognize and celebrate what they do know. If you have a post or an idea that you think would be particularly helpful, feel free to comment below. I'd love to hear your thoughts. Jonathan was a late talker too-- he didn't take off until about 21 months. Prior to that point, I found that he could point to things when I would name him and he'd follow directions, so I knew he could hear and comprehend. He just wasn't talking. I worried about him constantly! We also watched a lot of Signing Time (he would sign). 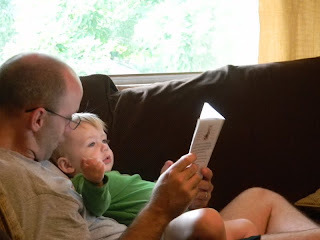 One book that I really liked was "How to Talk to Your Baby" by Dorothy Dougherty. Some of it was pretty basic, but she talked about five areas of language learning. (Naming, Describing, Comparing, Explaining & Giving Directions) with examples of how to incorporate each in daily life. It was pretty helpful for me. I really didn't need to worry about J. though. As soon as he could talk, I was amazed by how much he knew! Grace, my 1 year old, already has a lot to say-- it just doesn't make sense yet. :) I'm going to try some of these ideas with her! PS- Love the new blog design! One of my friends had a brother who had delayed speech development. If Michael were asked a question, his sister would pipe up with the answer, "He'll have a chocolate ice cream, Grandma!" I suspect Michael didn't need to rush into speech - his sister managed it very well for him. What you're doing sounds perfect - calm, no-nonsense, enriching and part of everyday life. He's lucky to have you, Jackie! Henry was also a late talker. Only said a few words at about 20 months and still not much when he turned 2. He started speaking in sentences though shortly after - around 26 months. It was nuts how fast it developed. We were referred to a specialist around 12 months because he wasn't babbling and stopped around 24 months. It just takes time. I don't think they did anything that we weren't already doing. It was just nice to have the reassurance. Hi! Just dropping by from We Teach. Really like your blog and looking forward to reading more. Great ideas to encourage talking. Both my husband and I were extremely late talkers, and we were so worried about our daughter that we decided to stick with one language instead of making her bilingual or trilingual. Now I wish we would not rush and worry. She was a very early talker, but we lost the chance to introduce foreign languages early. As always, great early literacy ideas! Wonderful vocabulary interactions that allow children to learn and grow at their own developmental pace.